If you have been following my layout posts so far, you know I want to keep my layout modules lightweight. I have been loath to go the usual route and use heavy plywood as sub-roadbed. Even lightweight (and very pricy) aircraft plywood can add a lot of weight to a layout very quickly. 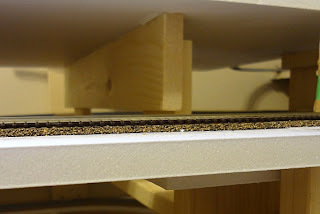 I considered using blue home insulation foam as sub-roadbed but it is flexible and fragile enough that it only works well laid directly onto a wood frame or tabletop and the thickness can make it awakward with hidden track and multiple levels. Insulation foam is still a fantastic material for a model railroad and I am sure I will be using some for scenery work at a later stage. 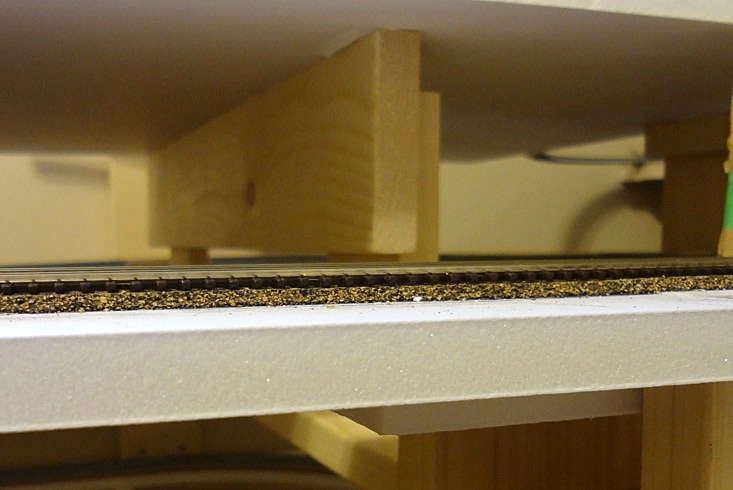 Sub-roadbed refers to the base foundation for your track. At its most basic, it can be a sheet of plywood on a simple frame. For more complex layouts it refers to the supporting platforms which the track is laid onto. I ended up choosing a product called Gatorboard or Gatorfoam (different manufacturers, similar product), a very lightweight, strong and warp resistant product used by sign-makers for indoor or outdoor signs. 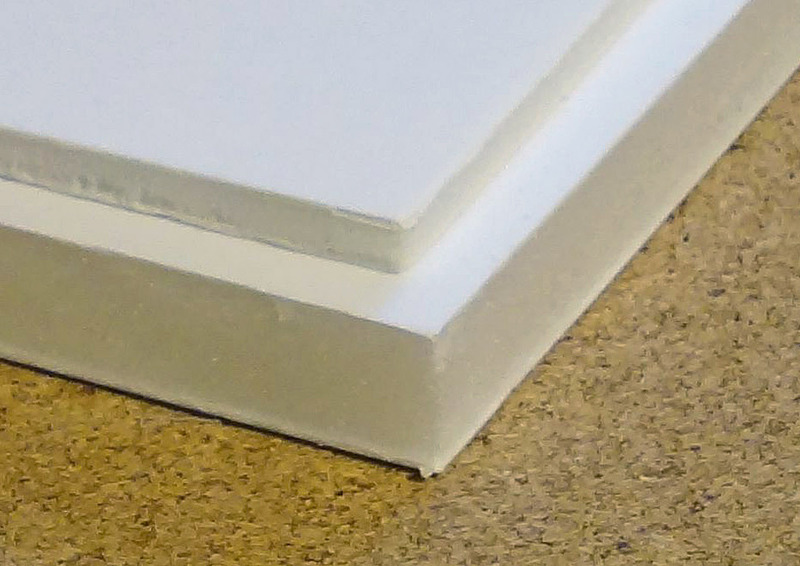 It is similar to craft-use foamboard in that it is composed of foam laminated between two thin layers of backing. However where foamboard uses soft cardboard backing, the material in Gatorboard is a waterproof wood fiber product and core is a strong extruded polystyrene foam. The extra stiffness and stability of this construction makes Gatorboard almost as strong as plywood but at about 1/5 the weight. A half inch 4x8 sheet of Gatorboard weighs roughly 10 lbs vs 50 lbs for a 1/2 sheet of plywood. Gatorboard has been around for years but is only getting some attention by model railroads in the past year or two. I was aware of Gatorboard though working as a graphic designer but never considered it as a layout material until I started seeing the odd mention of it in the hobby press. I first picked up a small 1/2" sample from a local art store to do some tests with and was very happy with the results. It was strong enough it did not need a lot of extra support when used as sub-roadbed and did not sag or warp. While the manufacturer notes that it cannot be cut with a hobby knife I was able to make accurate straight cuts with a sharp boxcutter blade and repeated scoring of the outer layers. For curved or longer cuts, a hand saw or regular power tools (use a fine, high-tooth count blade) cut it effortlessly. I also found the outer layers had enough of a rough finish that adhesives such as Weldbond or latex caulk held very well (improved by scuffing the surface a bit with sandpaper). You can use small screws to attach lightweight objects (e.g. stationary decoders or switch machines) to it but I would not recommend using screws for anything structural or important (use adhesive or good two-sided tape). It is more fragile than the same thickness of plywood when under heavy weight but I the weight trade-off is more than worth it and I would be comfortable using it with trains right up to O scale. Gatorboard or Gatorfoam is available at some art supply or framing stores but I bought mine from a sign-making supplier to get the best price. Most of these suppliers will sell to the public and you can get full 4x8 sheets at a great price. Gatorboard is about double the price of a good sheet of plywood but again, for me the weight trade off was well worth it. It is commonly available in a range of thicknesses from 3/16th up to 2 inches and in white, black, or craftpaper-brown finish.